The first time I had Char Sui Bao was in San Francisco. My husband and I were on vacation and having dim sum at a little place in Chinatown. 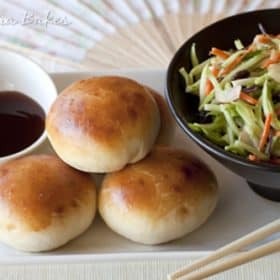 One of the foods they brought by the table were these fabulous bbq pork buns. It was love at first bite. 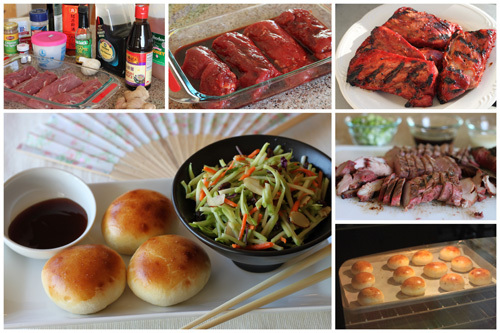 We were given several options on how to cook the Char Sui and I opted to cook it on the grill. Many of the other Daring Cooks omitted the food coloring from the Char Sui recipe, but I loved the deep red color it gave the meat. This meat is so flavorful, it was impossible to resist snacking on the crispy ends while I was chopping the meat for the filling. 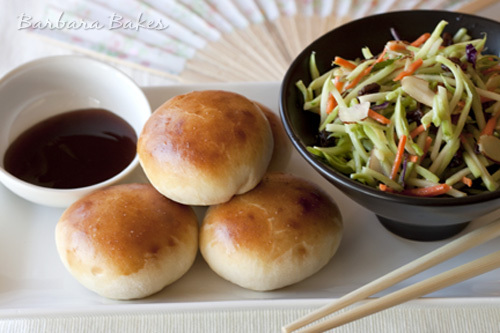 I served the buns with Panda Express Orange Sauce for dipping and a Honey-Orange Broccoli Slaw salad. I made it over three days. Marinating the meat one day, barbecued it on another, then baked the buns on the third day. I hope you’ll give this one a try. It’s well worth the effort. Trim the pork loin to remove fat and tendon and slice lengthwise so you have four long pieces, then cut in half. By cutting the pork in to smaller pieces to marinate you will end up with more flavorsome char sui. If you want to leave the pork in one piece you can do this as well. Place in container that you will be marinating them in. Combine all the other ingredients in a bowl and mix well to combine. Microwave the maltose in for a few seconds to make it easier to work with. Cover pork well with 3/4 of the marinade mixture. Marinate for a minimum of 4 hours, or overnight. Place the reserved 1/4 portion of the marinade covered in the fridge. You will use this as a baste when cooking the pork. Place marinated pork loin on the BBQ grill. Cook on a medium heat, approximately 15 minutes, until cooked through (145º), turning frequently and basting occasionally. Be careful to watch it closely so you don’t burn the pork. *Made twice as much Char Sui as called for in the bun recipe, so I double the filling ingredients and froze half to make another day. Heat the vegetable oil in a wok or pan. Add diced char sui to the wok/pan and stir then add spring onions, cook for 1 minute. Add hoisin, dark soy sauce and sesame oil to the pork mixture, stir fry for one minute. Mix cornflour and stock together and then add to the pork mixture. Stir well and keep cooking until the mixture thickens, 1 or 2 minutes. Remove mixture from wok/pan and place in a bowl to cool. Set aside until ready to use. Place the sugar and warm water in a bowl, mix until the sugar has dissolved. Add yeast and leave it for 10 – 15 minutes until it becomes all frothy. Sift flour in to a large bowl. Add yeast mixture, egg, oil and salt and stir. Bring the flour mixture together with your hands. Place dough on a lightly floured surface and knead for approximately 10 minutes. The dough should be smooth and slightly elastic. Place in a lightly oiled bowl and cover with a damp cloth. Leave to rise until it is double in size. This will take from 1 – 2 hours depending on weather conditions. Once dough has doubled in size knock back and divide in to 12 portions and shape in to round balls. Place a good sized tablespoon of filling on the dough circle. Then gather the edges and seal your bun. Place the bun seal side down on your baking tray. Continue with rest of dough. Once all buns are complete brush surface with egg wash.
Place in a preheated oven of 400º F for 15 minutes or until golden brown. Visit the Daring Kitchen for information on joining the Daring Cooks and to see all the great buns the Daring Cooks cooked up this month. Thanks Sara for a terrific challenge. Just one thing… after filling the buns and brushing with egg wash, do you allow buns to have a final proof or are they straight into the oven? No second proofing, just straight into the oven.